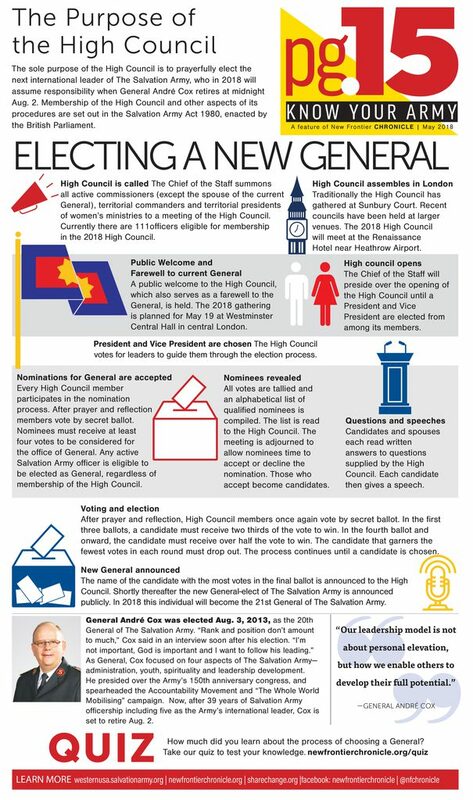 How does The Salvation Army High Council work? Chief of the Staff Commissioner Brian Peddle formally summoned 111 qualifying officers in mid-April to form the next High Council, meeting in London starting May 17 to elect the 21st General of The Salvation Army. The High Council comprises all active Salvation Army commissioners, those officers who hold the appointment of Territorial Commander, and those who hold the appointment of Territorial President of Women’s Ministries. The High Council is convened by the Chief of the Staff, who will lead until a President and Vice President are elected from among its members to oversee the prayerful and holy tasks leading to nominations and elections. Any active Salvation Army officer from the 128 countries in which the Army operates is eligible to be elected as General. The man or woman chosen in this process will take office Aug. 3, following the retirement of General André Cox who has led the Army since Aug. 3, 2013. Take the quiz here to test your knowledge. I would love to see, Senior Soldier Observers allow to be at the High Council !! !